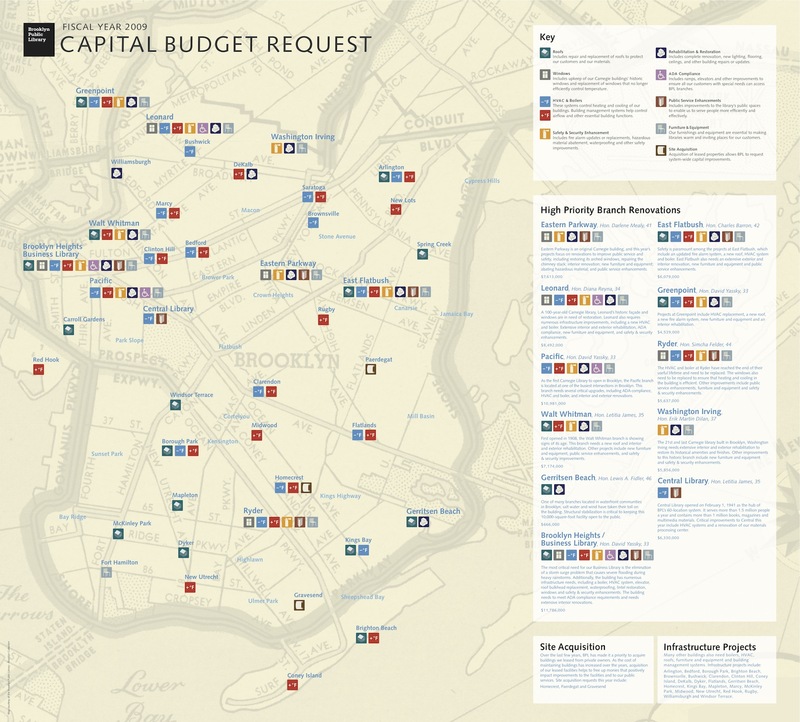 Brooklyn Public Library Capital Funding Woes: How Did Things Get So Bad? 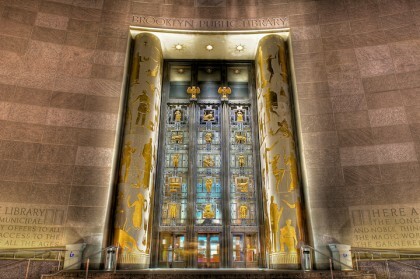 Before Linda E. Johnson ever walked through the revolving doors of the Brooklyn Public Library’s majestic Art Deco headquarters to take over as the Library’s fourteenth director on July 1, 2010, BPL’S well-being was seriously threatened by a crushing capital shortfall amidst record usage. Following almost a decade of uneven management, first by Ginnie Cooper, who helmed the Library from 2003 to 2007 before leaving abruptly to lead the D.C. Public Library, and then Dionne Mack-Harvin, BPL’s director for three years whose contract was not renewed, Ms. Johnson inherited an aging institution that was–ironically–experiencing one of the most dramatic growth spurts in its 108 years of existence. According to Branches of Opportunity, an influential publication by the Center for an Urban Future, from 2002 to 2013 all three public library systems in New York City—the New York Public Library, the Queens Public Library and BPL—experienced a 40 percent increase in the number of people attending programs and a 59 percent increase in circulation. The numbers for BPL’s then-58 branches (the Library now counts 60 branches, including a rebuilt Kensington library and the Business and Career library) were especially pronounced: a 77 percent jump in circulation and a corresponding 41 percent increase in attendance. This spectacular growth was tempered by an increasingly grim reality: BPL’s aging infrastructure, including 18 beloved “Carnegie Libraries” built in the early 20th century as a part of philanthropist Andrew Carnegie’s massive building program, was in a desperate state of disrepair. In 2008, then-Director Mack-Harvin, who had started at BPL in 1996 as a librarian at the Crown Heights branch, attempted to publicize her organization’s plight: she launched a campaign to alert both the general public and city and state politicians to BPL’s massive capital infrastructure problem. Simply titled “Fiscal Year 2009 Capital Budget Request,” an elegantly designed pamphlet identified BPL’s worrisome infrastructure deficit. With detailed lists of branches, their specific needs, and the New York City Council Member in whose district the branch was located, the publication clearly articulated an urgent message: BPL needed cash. Listing a total of $75,115,000 in High Priority Branch Renovations, $6,000,000 in site acquisitions, and a total of $29,351,000 in Critical Branch Infrastructure Requests, the list concludes with a “Grand Total” of $115,983,000 in 2009 Fiscal Year requests. Cadman Plaza Branch a Victim of Fundraising Shortcomings? The Brooklyn Heights Blog has been rebuffed each time it has sought explication from those in a position to know about BPL’s finances in the years preceding Ms. Johnson’s tenure. In response to an email inquiry, Ms. Mack-Harvin, now head of the El Paso, Texas Library system, replied, “I have not been involved with the Brooklyn Public Library for many years. I do not have anything to add to the discussion.” John Vitali, long-time BPL CFO and Executive Vice President, and now VP of Finance and Administration at USciences, in Philadelphia said, “Given my long-standing fiduciary role at the Library I still feel bound by a level of confidentiality that prohibits me from discussing this matter; so I respectfully decline your invitation to do so.” Former Council Member David Yassky, in whose district both the Brooklyn Heights and Pacific branches lie, was brief. “My experience with both Pacific and BH is that they provide excellent service” commented Mr. Yassky, now the Dean of Pace University’s Law School. Given BPL’s capital funding shortfall, currently pegged at $308 million dollars, including $82 million in immediate needs, the campaign obviously fell well short of its intended goals. In 2010, even though she had successfully secured an additional $10 million in city funding in her first year as BPL director, Ms. Mack-Harvin was let go. Her departure was mainly due to an embarrassing public relations episode related to BPL staff layoffs, but it is likely that the Library’s operating deficits in Fiscal Years 2009 and 2010—under Mack-Harvin’s watch—eroded confidence with BPL’s board. By the middle of 2010, a new director had been secured on an interim basis: Linda E. Johnson, a photogenic, Philadelphia-born lawyer, who arrived at Grand Army Plaza bearing at least two attributes that would have greatly appealed to BPL’s Board of Trustees: her recent stint as Interim President and CEO of Philadelphia’s National Constitution Center, where she worked with, among others, President Bill Clinton on fundraising and special events; and a high-profile romance with Leonard Lauder, heir to a lucrative cosmetic industry fortune and one of New York City’s leading cultural philanthropists. When Ms. Johnson arrived that July morning for her first day on the job, it’s unlikely that it occurred to her that the failure of her immediate predecessor’s capital funding efforts, as well as two seemingly innocuous library branches, might define her tenure as Director of the Brooklyn Public Library. Publisher’s Note: This is part one in a three-part series on the Brooklyn Public Library, in particular the conditions that have led to the proposed sale of the Brooklyn Heights Library branch. These articles are made possible thanks to the generous support of BHB readers who contributed to our IndieGoGo campaign. Important context to evaluate all of this: The Bloomberg administration was looking at selling a long list of libraries for redevelopment at least by the summer of 2007, the same year it blessed the sudden, secretive sale of Donnell Library for a pittance. The BPL decision to sell and shrink the Brooklyn Heights Library goes back at least to 2008, even though the pubic was not told until 2013 when plans were being rushed forward at the end of Bloomberg’s term. By contrast, until shortly before those Bloomberg dates above we were looking at Guiliani administration plans to infuse capital funds into into libraries for their expansion. But going deeper in debt solves everything. I see. We need new solutions and a bond issue is the farthest thing from it. Completely in favor of right sizing bloated salaries, but it doesn’t even scratch the surface. As for alternatives, the issue has been out there for a long time. If there aren’t viable alternatives out there yet (isn’t that what your organization should be doing already) then there aren’t any. And what happened to the bond issue? That had been your answer which you said was absolutely going to be passed by the Legislature. Important context to evaluate all of Michael DD White’s statements: the complete and total lack of documentary evidence for anything that he says, other than conversations he claims to have had with people he refuses to identify at dates and times he can not specify. I would take the time to look at the overall picture. Few people take the time and just give the board a pass. Library trustees could be out of control and that needs some looking into. The costs for repairs are never actually analyzed or supported by any fact base you and I get to review. That alone should be enough to clamp down. Look at the queens public library and how that was addressed pronto.